My daughter's Christmas dress got done just hours before it was worn, thankfully my son's Christmas outfit was completed in mid-October (you can find the Patchwork Blazer tutorial here). This was not the Christmas dress I originally had planned back here, that dress will have to wait for a future project. 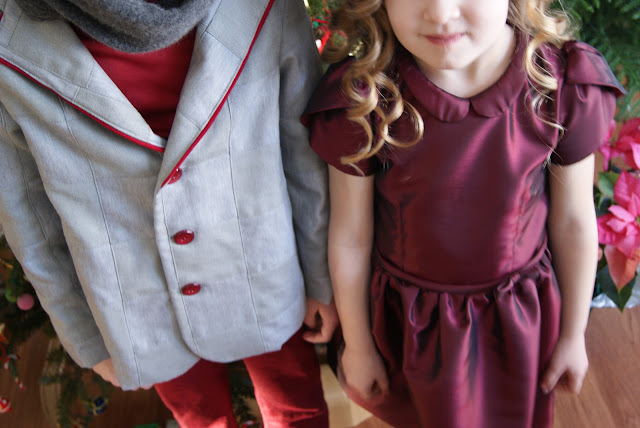 THE PATTERN// Oliver + S Fairy Tale Dress, size 5, view A: a fitted dress, fully-lined, special-occasion dress with crinoline, a Peter Pan collar, tulip cap sleeves, tubular waistband, and front bow detail. It is given a 3 out of 4 scissors rating. THE FABRIC// Deep red/maroon/bordeaux taffeta, although it looks almost purple in some photos, it doesn't look purple in real life. Deep red tulle for the crinoline and deep red cotton for the lining. THE SEWING// I followed the pattern and instructions very faithfully. The only change was that I used a 9" invisible zipper instead of a 16" one (as I had bought all the materials months ago thinking I was going to sew a different dress), so the dress is a little tight to put on and take off. This is my 3rd time using this pattern. I first used the bodice for the Purpledicular Dress, then used the whole pattern view A for the Gabriella Dress Knock-Off, and now sewing it for the 3rd time I really think it should be given a 3.5 or 3.75 out of 4 scissors rating as all of those wonderful details are super duper time consuming. I'm not a huge fan of sewing collars, this one is OK. I'm also not a huge fan of sewing in those dreaded set-in sleeves, but these tulips cap sleeves are a dream to sew and the end result is absolutely lovely! This is the 2nd time I've sewn this dress with the sleeves and I think I need to adjust the bodice front where it attaches to the sleeves because she is so narrow in the shoulders. 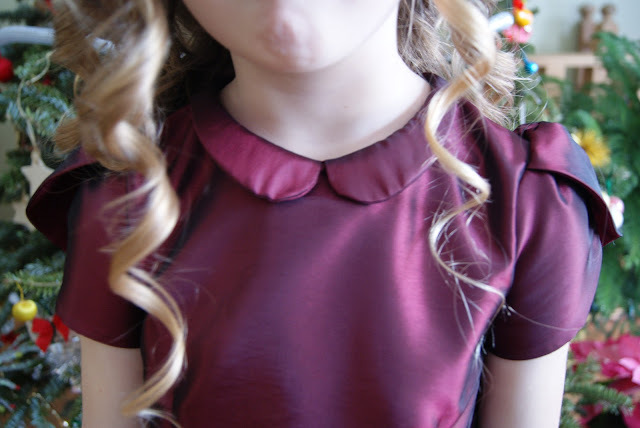 FYI, the curls in her hair were achieved by using Curlformers, one of her Christmas gifts. It had been way too long since I sewed something specifically for Christmas... way back in 2009 it was a green polka dot peasant dress with red & white striped knitted accessories.